Jenny and I were so excited! We made our very first tiramisu and although it wasn’t that hard there was a bit of pride in our work. But that pride and joy did not last long. Jenny had a hen’s night to go to but the tiramisu wasn’t destined for that type of action. 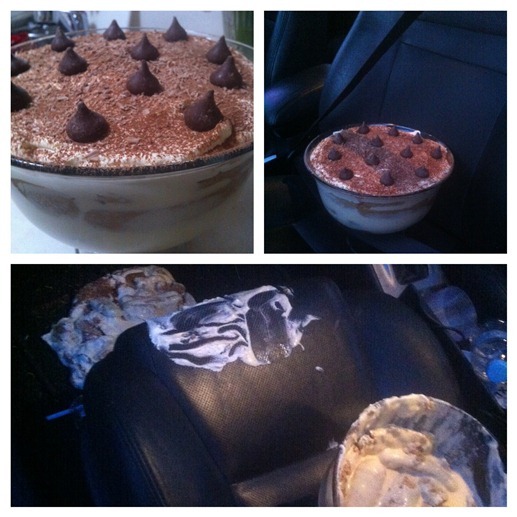 So Erwin was running solo heading to another party and thought that strapping a seatbelt on for Mr Tiramisu into the front seat would be a good idea. Boy was he in for a surprise. A heavy foot on the break pedal and BOOM!
. He was totally shattered but at least there was half left and a story to tell when he got to the party. And that’s THE END of my EPIC FAIL moment.